Forum member Mark Dalzell (aka “MDSlammer”) is an avid long-range shooter and talented movie-maker. Some months ago, he produced a great video about shooting his Savage 110 BA at 1200 yards. That video was a hit with readers, and now Mark has come up with a new video, with the range pushed out to 2300 yards (that’s 1.3 miles!). Mark and his compatriots Dale Jorgensen and Gio Valdez headed out to their “secret spot” in the high desert, near Jean, Nevada, armed with a pair of 7mm RSAUMs and Mark’s .338 Lapua Magnum Savage 110 BA. Given the degree of difficulty, it’s not surprising that Mark’s gang had more misses than hits this time out, but they did produce an entertaining video that shows the challenges of shooting at Extreme Long Range. 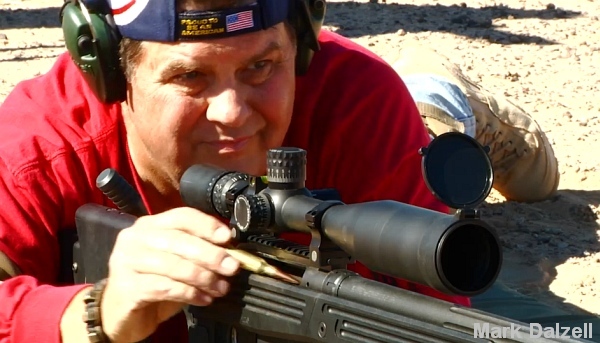 Mark was shooting a Savage 110 BA .338 Lapua Magnum, the same gun he used for his previous 1200-yard high desert shooting safari. The elevation required to get on target at 2300 yards was mind-boggling. 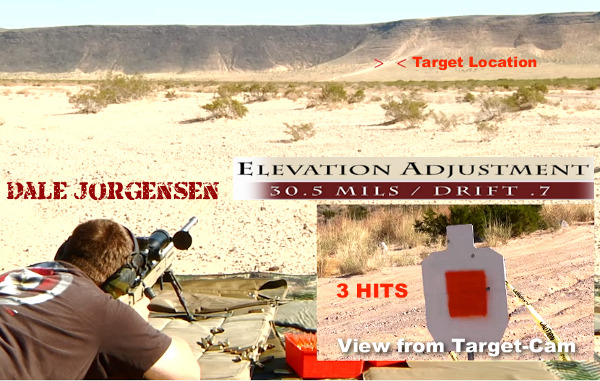 Elevation for Mark’s .338 LM was 96.5 MOA (on top of a +40MOA rail). Mark’s buddy Dale was running a full 30.5 MILs of elevation with his 7mm RSAUM with milrad optic. 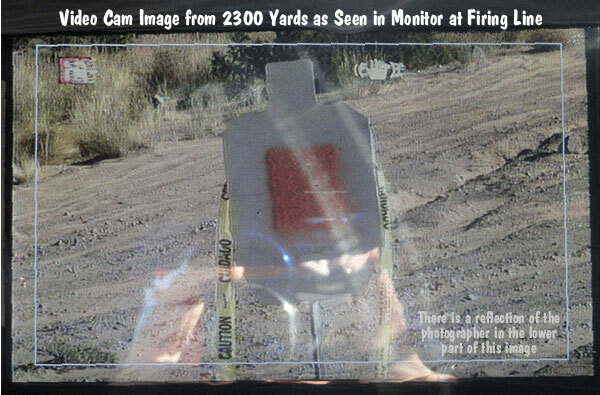 Mark set up a wireless remote camera near the target, so you can see where the shots impacted. A second camera was behind the trigger-pullers, giving a “shooters’-eye view”. The target was a full-sized steel silhouette with an orange square painted in the middle. During our 2300-yard shooting adventure, I had just one hit out of 30 rounds fired. I was rather disappointed with my performance. To get my confidence back, I decided to move the target in a bit closer — to one mile (1760 yards). Shooting a mile for me is still a challenge each and every time. But it’s 1760 yards vs. 2300 yards. At one mile, the variables are slightly less critical — but not by much. But this time I had much better success, scoring 8 hits out of 30 rounds. The weather was almost perfect for shooting a mile: extremely clear with only 1-2 mph wind and cool temps. Location was the same — the Dry Lakes near Jean, Nevada. But this time I was all by myself. For me, it was very calming, almost spiritual, despite the .338 Lapua screaming after every round. Shooting 30 rounds and getting 8 hits at a mile was good enough to restore my confidence if only for that day. There’s always the next time to improve upon. I did find that the Berger 300gr Match Hybrid OTM Tactical bullets are a bit more accurate than the lighter loads I was using before. I ran these rounds last week through my chronograph. They were averaging 2840 fps. I’m using Hodgdon H-1000 with Lapua Brass and Federal 215m primers. 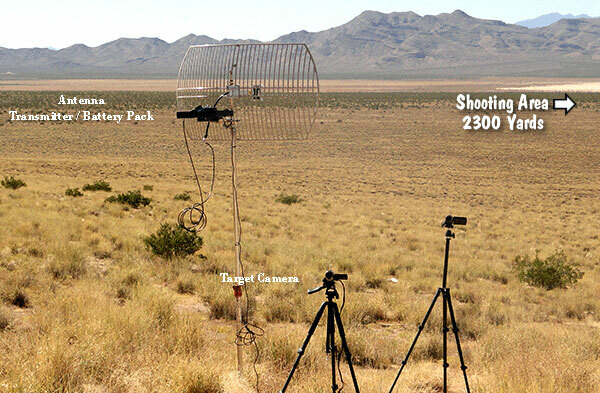 Mark Dalzell’s videos feature live target images captured from long range. 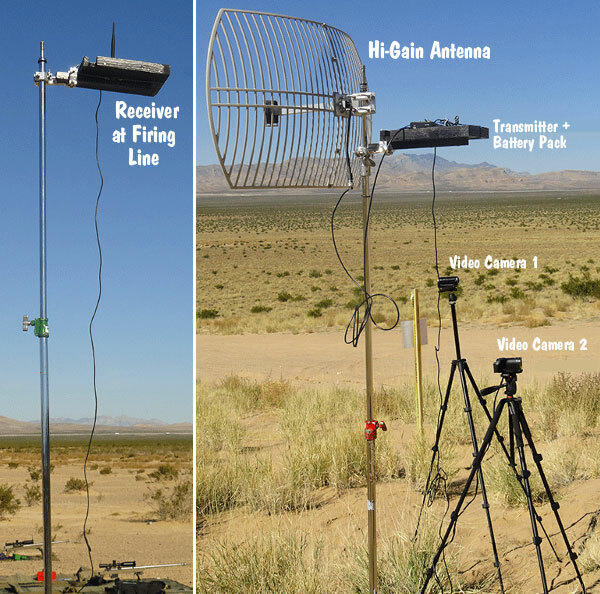 In order to see both hits and misses at that extreme range, Mark assembled a target-cam system that broadcasts multiple video cam feeds wirelessly to a receiver on the firing line. Down-range, Mark positioned a high-gain antenna. 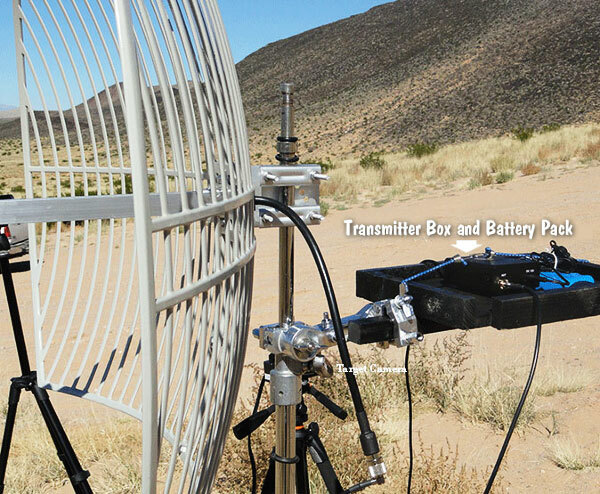 This was key — without the antenna the system’s useful range was less than 1000 yards. 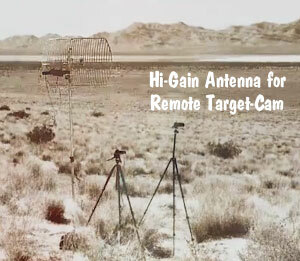 But with the hi-gain antenna Mark gets very clear signals from 2300 yards.